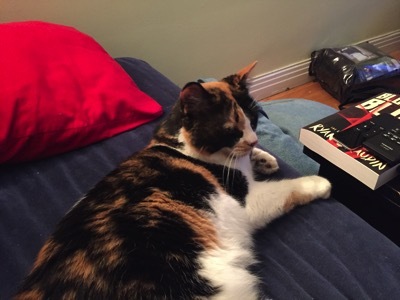 Reading roundup – New Kitty! Good morning fellow bookworms. The big news in my family this week is that we adopted a cat! Meet Pavlushka, a seven year old female adopted from the Montreal SPCA. I have tried for many months to fill the cat shaped hole in my soul without success, and I am so, so grateful to Thad for accepting a new feline into our home. Lushka is a curious, affectionate cat according to her profile and she was certainly happy to be petted at the SPCA. Lushka really enjoyed being out of the shelter and being fussed over last night. She spent most of the evening on the sofa next to me demanding pets. She has already worked out how to open our kitchen cupboards. I think she’ll be a wonderful fit for our household. In more reading-related news, I did something I don’t often do this week – consigned a book to the did not finish pile. This was Ice Like Fire by Sara Raasch. As I mentioned in my review of the first book Snow Like Ashes, I found the plot rather predictable, and unfortunately for book two, the interesting worldbuilding was not enough to carry me through this time. I’ve also been continuing with my ARC of Blood for Blood by Ryan Graudin (fully as excellent as I expected it to be so far.) and Evelyn Skye’s The Crown’s Game which is improving the further along I go. Before the Snow, a prequel to Danielle Paige’s Stealing Snow was released this week. I have read it and enjoyed it. I should note that I have read Stealing Snow – I got the ARC at BEA this May. I will say though that some of the twists of Stealing Snow were stronger to me for not having read Before the Snow. I would suggest holding back on this and reading it afterwards as background reading. I did really love the tie in with some of Andersen’s other fairy tales. This weekend, of course, sees the release of Harry Potter and the Cursed Child. I will certainly be devouring it as soon as it hits my Kindle on Sunday morning. I’ve heard snippets about the story, and seen the rave reviews so I Iook forward to reading it for myself. I’m still really hoping they will film the play and show it in cinemas. August and September are generally big months for new book releases and this year is no exception. This August there are five books coming out about which I am super excited. First up is Rick Riordan’s For Magnus Chase: Hotel Valhalla Guide to the Norse Worlds. For those of you who don’t know, Magnus Chase is the protagonist of Riordan’s Norse mythology based middle grade series. I don’t know about you, but I’m not as familiar with Norse mythology as I am with Roman and Greek (the basis of Riordan’s other series) so I think this book will be extremely useful – and knowing Riordan, very funny too. For Magnus Chase: Hotel Valhalla Guide to the Norse Worlds is released on August 16th. Next up on August 23rd is Blake Charlton’s Spellbreaker, the third in his Spellwright trilogy. For those of you unfamiliar with this series it has one of the most interesting magic systems I’ve read. If Charlton’s world, words literally have power and take physical form. I’m really looking forward to seeing how this series ends. Queen Rising is the second in Danielle Paige’s prequels to her Snow Queen retelling Stealing Snow. As I mentioned earlier, I have read Stealing Snow and felt that the first prequel weakened some of the twists of the main novel. I’ll be interested to see if the same is true for this one. Queen Rising is released on August 30th. Also scheduled for release on August 30th is Furthermore, Shatter Me author Tahereh Mafi’s first foray into middle grade. I picked up a copy of this at BEA, but sadly it never made its way back to Montreal. It does sound like a fun read. Finally on August 30th we have The Bronze Key, the third in Holly Black and Cassandra Clare’s Harry Potteresque Magisterium series. I’ve really enjoyed this series so far, mainly because of the very clever twisting of the Harry Potter tropes. I’m definitely looking forward to continuing this. What books are you most looking forward to in August? Let me know in the comments!